The $49.99 season pass for Call of Duty: Infinite Warfare gets you four map packs with four new multiplayer maps each. What it doesn’t guarantee is that these new maps will actually come up in multiplayer matches online. In my experience so far, playing a DLC map is like finding a unicorn. You can own Infinite Warfare’s first DLC package Sabotage, released on January 31, and play for hours and hours and never see any of its maps pop up in the rotation. 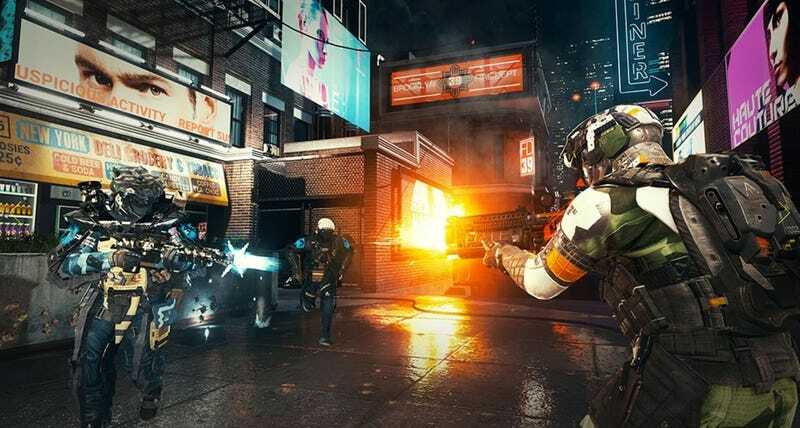 This is a huge shame, because this pack has some really nice multiplayer maps: Noir is a night map in a futuristic Brooklyn setting, but I’ve personally only played it once since the Sabotage DLC was added into the regular rotation. Continuum, the 2nd map pack released on April 18, can currently only be played in special playlists devoted to Continuum maps only. Put simply, if you want to play the four most recent DLC maps, you have to play a Team Deathmatch or Mixed game mode playlist that only rotates those four maps. So everyone who purchased the DLC and wants to play the Continuum maps must replay the same four maps over and over. Also, there’s a struggle even finding matches within these special DLC Playlists, especially if you’re a night owl, because the player base dwindles down lower after dark. Infinite Warfare’s outer-space setting “didn’t resonate” with players, Activision said earlier this year, noting that sales of the series had taken a downward turn. Unlike previous COD installments, Infinite Warfare doesn’t tell you have many people are actively playing the game at any time. But while last year’s entry Call of Duty: Black Ops III is on Steam’s current top 100 playlist, Infinite Warfare is nowhere to be found. And players also have the option of playing Modern Warfare Remastered instead, this year. So it does seem like a smaller group of people is playing the latest Call of Duty, and only a subset of those players is buying the DLC, enough to make the maps quite rare to be found. I agree with Reddit users like soldier4hire75, who asked for a permanent “DLC playlist” where these maps could be enjoyed on a regular basis. Otherwise, if you’ve recently purchased the content and haven’t viewed the Sabotage DLC maps yet, you’ll likely need to visit them in a private match with friends.